reasons for us to pick you:I think you should pick me because 1. I will be verry active. 2. I am very helpful and generis. 3. I love to make videos and support people's dissions.. Even Though I can't donate... I will donate with making videos. 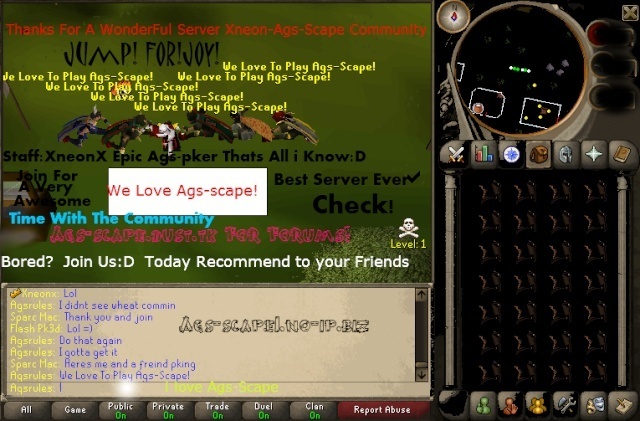 recent experience:I have been admin on three servers... Juvyscape , Darkbow scape ( not around anymore) and , perfect scape. I have been mod on 13 servers. I can't name them all. Sorry. extra:I will be active and helpful if you chose me. If not i will still be active and helpful. I hope you enjoyed this little application I hope you chose me. why do you think u deserve Moderator? :I think i deserve it because I try to be active I haven't been for a while because of work but that's over so =) Well Thats why. I help I make videos and I love the server. What should you do when you are moderator? :I should follow the rules. Inforce the rules Have fun don't abuse my powers and don't give up. have you ever been staff on other servers? :Yes I have been every rank there is. I even owned a 317 before. Will you advertise for the server? :Yes I will make videos. Thank you very much for your time to write and organize your application ^_^. We will review your status online, your overall rating from other players through ::suggest liltobig and their reason for suggesting you.